As part of MECA’s two-day Día de los Muertos Festival, ROCO’s Musical & Literary Ofrenda event will feature a new commission based on texts by Mexican poet Amado Nervo, new music by Mexican composer Alejandro Basulto, and showcase an exhibition of handmade retablos by local artists in partnership with Lawndale Art Center. Alongside this event, the new team of Spanish Inprint Poetry Buskers will be on hand to write free poems on customized themes for event attendees. Come by, see the retablos, enjoy the beautiful music, and get a free poem in Spanish. 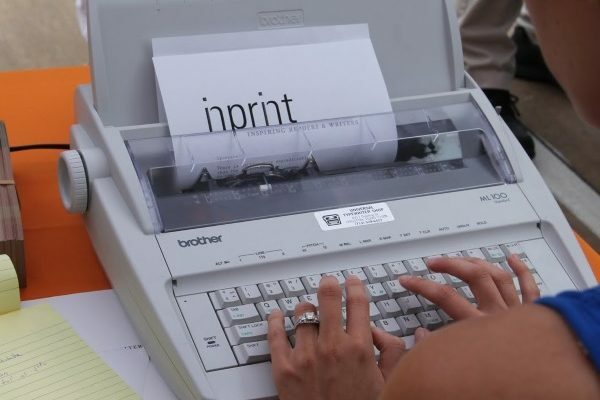 The Inprint Poetry Buskers are a team of local writers and graduates student from the University of Houston who go to festivals and special events writing poems upon requests for people. Through the Inprint Poetry Busker program, Inprint has been able to bring the joy of poetry to communities all over the city.